‘Fruit small, approaching the middle size, depressed, globular, about two inches and a half deep, and the same in diameter. Eye small, open, in a regular-formed shallow depression. Stalk short and thick, inserted in a rather wide funnel-shaped cavity. Skin rather rough, yellowish green; but of a dull brown on the sunny side, and full of grey scabrous specks. Flesh whitish, melting, a little gritty next the core, with a sugary and richly perfumed juice. Ripe the beginning of October, and good till the end.’ [George Lindley – Orchard Guide p.353/1831]. Bergamot pears have been recognised from remote antiquity. The name is probably derived from the Turkish beg or bey, a prince, and armoud, a pear. It was first written Begarmoud, the Prince of Pears, and later corrupted to Bergamot or Bergamotte. [HP pl.LIII/1878]. Hedrick asserts that the English Autumn Bergamot is different to the French pear of the same name. 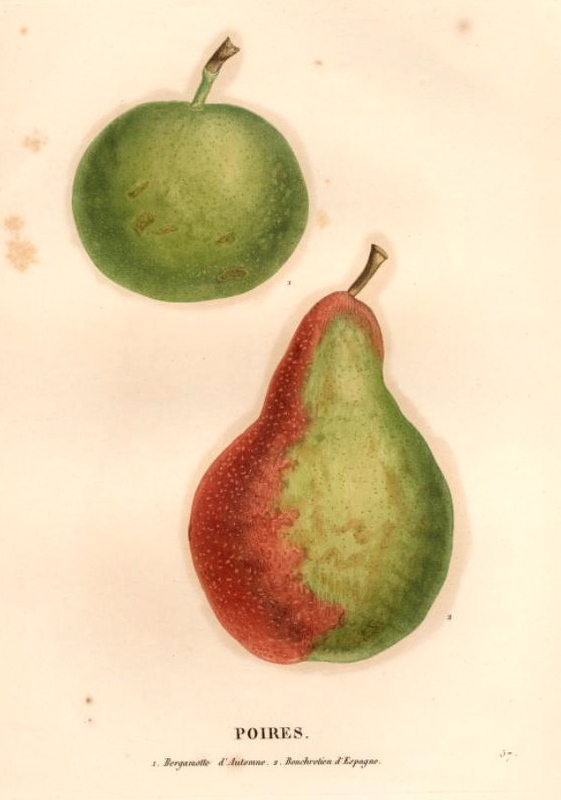 However it is likely that Macarthur introduced the pear described by George Lindley. ‘The English Autumn Bergamot or Common Bergamot is a distinct variety and not synonymous with the Bergamotte d'Automne of France. Writing in the early part of the eighteenth century, Switzer stated, and his statement was endorsed by Lindley in 1831, that the Autumn Bergamot was introduced into England in the days of Julius Caesar, that it was possibly the Assyrian Pear of Virgil, and was in that case to have been found in the "once celebrated and famous gardens of Alcinous." This is a doubtful conjecture, though without doubt the variety is of very ancient origin.’ [Pears of New York p.256]. Also figured in Jardin Fruitier du Muséum [JFM vol. 4/1861], the Pomological Magazine [PM pl.120/1830] and in Saint-Hilaire [pl.57/1828]. ‘Colour greenish-brown; form round; size under medium; quality excellent, the flavour being peculiar and rich; bears best on old trees, or when grafted upon the quince. In use during March to May.’ [NHM vol.1, p79/1864]. Listed in all published catalogues [Pear no.7/1843]. There are no diary notes for this pear. Pear Autumn Bergamot | Saint-Hilaire pl.57/1828 | BHL. Autumn Bergamot is the round pear at the top.